According to a recent report by Challenger, Gray & Christmas, 51 million Americans—about 20% of the total U.S. workforce—plan to participate in workplace pools for NCAA basketball this year. And according to an earlier MSN survey, a much greater portion will spend some time at work tracking March Madness. When estimating an average of three hours per office pool participant, Challenger projects a March Madness impact of nearly $4 billion in lost productivity in the first week of the tournament. On the other hand, office pools can be a simple, natural way to improve communication and morale in the workplace, and employers cracking down on the madness could risk harming employee loyalty and engagement. Research by OfficeTeam shows nearly one-third of senior managers agree that activities tied to March Madness boost employee morale. 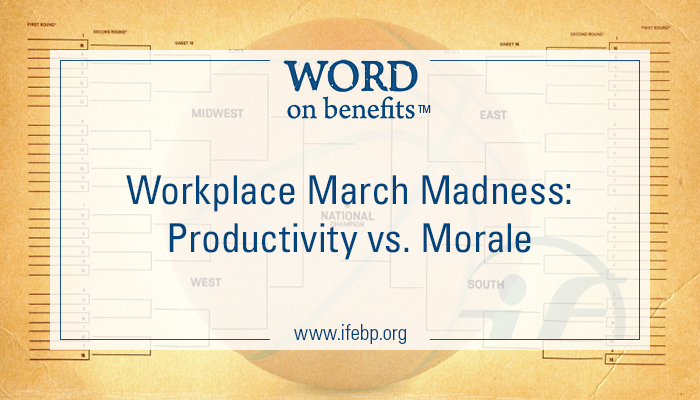 And, maybe more surprisingly, more than one-quarter felt March Madness has an overall positive impact on worker productivity. Which side are you on this March Madness season? Where do you stand? Do you see March Madness as a distraction that needs some oversight? Are bracket pools a common activity in your office? Vote and see where you stand compared with your peers. Comment below with your experiences. If you’re curious about common employer monitoring practices this time of year, check out our 2015 survey results that found about half of all employers monitor the Internet sites visited by employees. And if you’re feeling nostalgic, take a look back at the results of last year’s Benefits Madness, where health care emerged victorious among a field of 64 prized employee benefits. As for me, I’ll be catching a few glimpses of NCAA games at the office safely—Games in the opening rounds usually play in our staff cafeteria for lunchtime viewing.